Eugenics, A subject for investigation rather than instruction. 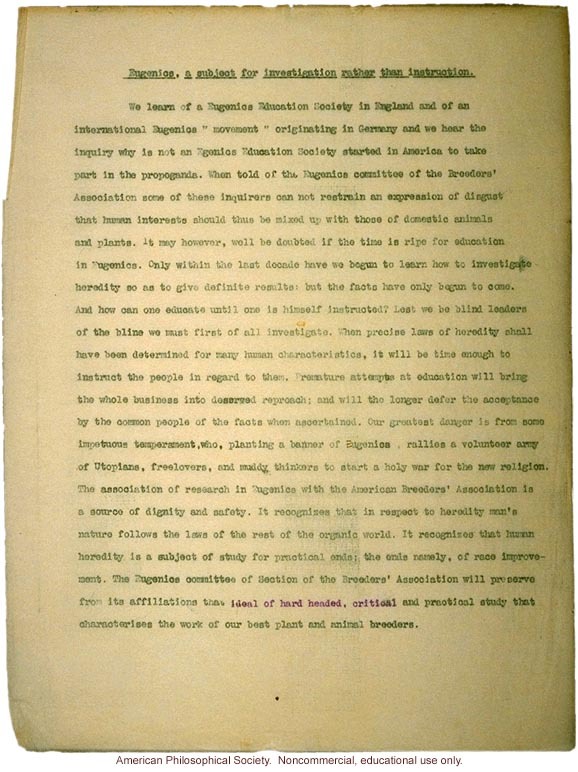 We learn of a Eugenics Education Society in England and of an international Eugenics "movement" originating in Germany and we hear the inquiry why is not an Egenics[sic] Education Society started in America to take part in the propoganda. When told of the Eugenics committee of the Breeders' Association some of these inquirers can not restrain an expression of disgust that human interests should thus be mixed up with those of domestic animals and plants. It may however, well be doubted if the time is ripe for education in Eugenics. Only within the last decade have we begun to learn how to investigate heredity so as to give definite results: but the facts have only begun to come. And how can one educate until one is himself instructed? Lest we be blind leaders of the bline[sic] we must first of all investigate. When precise laws of heredity shall have been determined for many human characteristics, it will be time enough to instruct the people in regard to them. Premature attempts at education will bring the whole business into deserved reproach; and will the longer defer the acceptance by the common people of the facts when ascertained. Our greatest danger is from some impetuous temperament, who, planting a banner of Eugenics, rallies a volunteer army of Utopians, freelovers, and muddy thinkers to start a holy war for the new religion. The association of research in Eugenics with the American Breeders' Association is a source of dignity and safety. It recognizes that in respect to heredity man's nature follows the laws of the rest of the organic world. It recognizes that human heredity is a subject of study for practical ends; the [ILLEGIBLE] namely, of race improvement. The Eugenics committee of Section of the Breeders' Association will preserve from its affiliations that ideal of hard headed, critical and practical study that characterizes the work of our best plant and animal breeders.